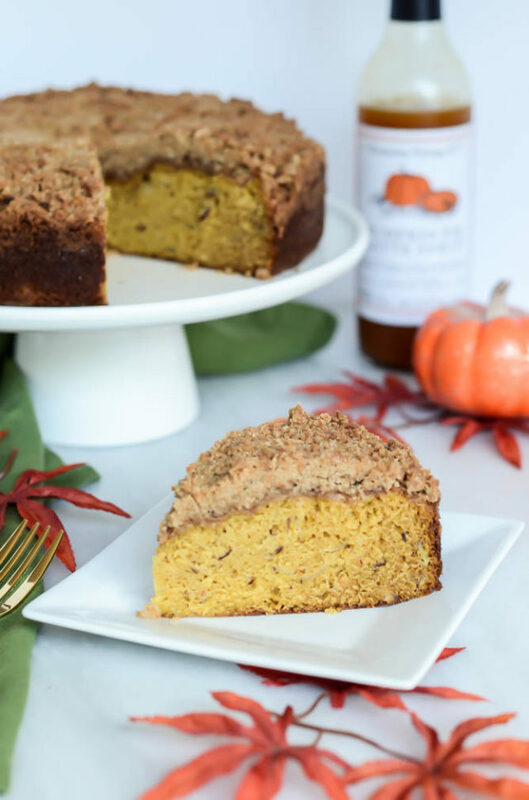 What better way to kick off the month of October than with the most delicious pumpkin coffee cake in all the land? 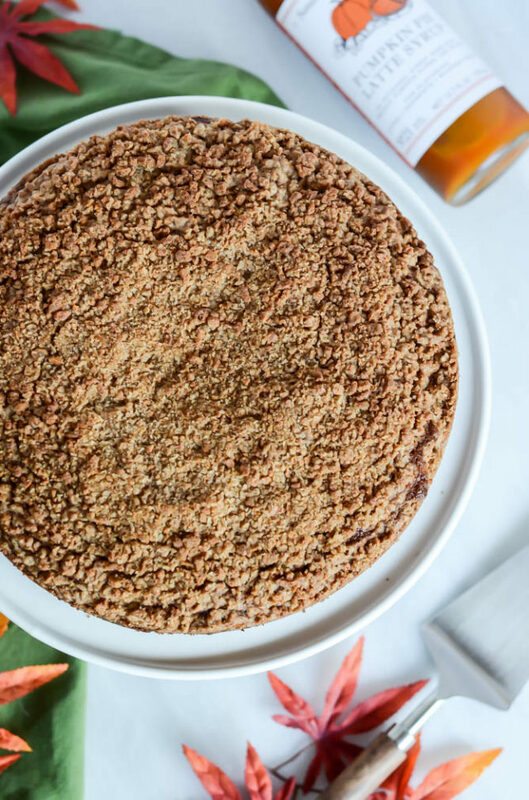 This post is sponsored by Sonoma Syrup Co.
I’m 100% confident that after tasting this Pumpkin Spice Coffee Cake with Amaretti Crumble, you’ll never want to try another coffee cake recipe ever again. 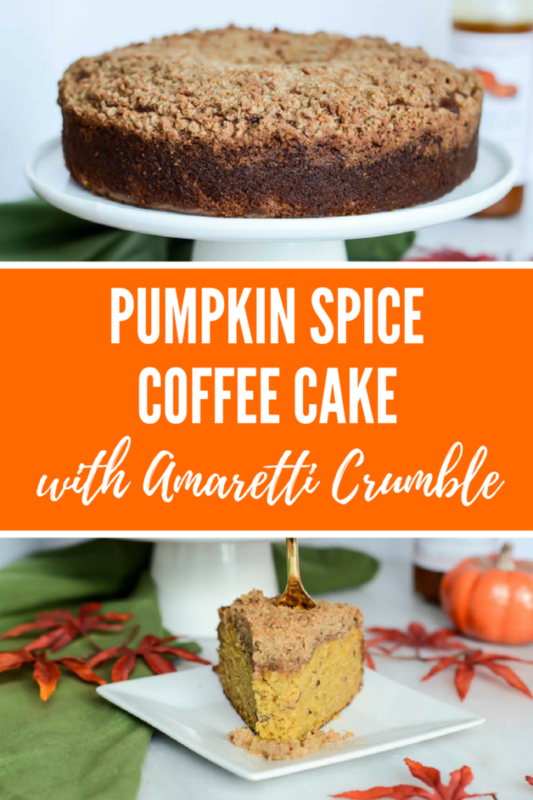 It’s dense and perfectly moist (thanks to Sonoma Syrup Co.’s seasonally appropriate Pumpkin Pie Latte Syrup AND good ol’ pumpkin purée), studded with toasted almonds and topped with the most delicious amaretti and brown sugar crumble you can imagine. Did I mention there’s also a touch of amaretto liqueur? You guys, fall never tasted so good. But before we get to the main event, let’s first talk about this amazing-ness that is Sonoma Syrup Co.’s Pumpkin Pie Latte Syrup. I had never been so excited to learn that I could make my own PSL’s at home with the simple addition of this thick orange syrup made from organic pumpkin and spices. And TBH, even when I’m too lazy to whip up a full-on latte and resort to a cup of coffee instead, I still add a dash of this syrup along with my unsweetened almond milk to spice things up a bit. Often, the PSL’s I get at Starbucks or Peet’s are much too sweet for me, so I love that with this Pumpkin Pie Latte Syrup I can control how much I add and just get that perfect hit of flavor without all of the sweetness overload. So, when Sonoma Syrup Co. asked if I’d be interested in creating a recipe using said syrup, I naturally jumped at the chance. Whenever fall rolls around, I immediately start thinking about all of the seasonal recipes I want to make for the next few months. 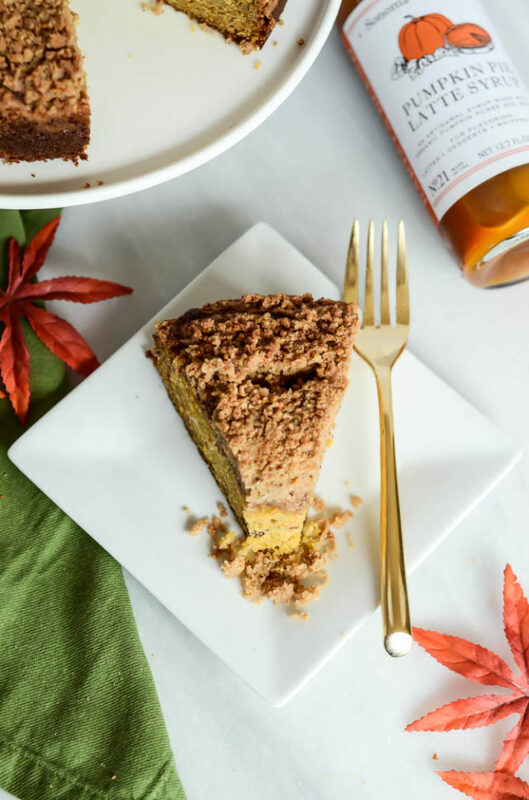 Without fail, one of the very first recipes that always pops into my head is a Pumpkin Coffee Cake recipe I got from my friend Meghan way back when I was living in Napa and we had an annual Pumpkin Party. Anyhow, one thing I could continue to make even as the annual Pumpkin Party faded away was the delicious Pumpkin Coffee Cake Meghan made that first year we hosted it. I knew that creating my own special version, with the help of Sonoma Syrup Co.’s Pumpkin Pie Latte Syrup, would be the perfect way to kick off the season and start a delicious new tradition that would make me miss our Pumpkin Party just a little bit less. I played around with the batter a little bit, making room for both the Pumpkin Pie Latte Syrup AND fresh pumpkin (the more pumpkin flavor, the better!) I also decided to sub in slivered almonds for the originally called-for walnuts and use a delicious amaretti cookie crumble topping instead of the oatmeal-brown sugar topping from the original recipe. In case you’re unfamiliar with amaretti cookies, they are a crunchy Italian cookie often dunked in espresso. Their crunchiness also makes them very well-suited to be blitzed into a topping, and their rich almond flavor is just to die for. Naturally, because of all this almond, I thought a touch of amaretto liqueur in the batter would also be just the perfect little touch to my new take on this already delicious recipe. 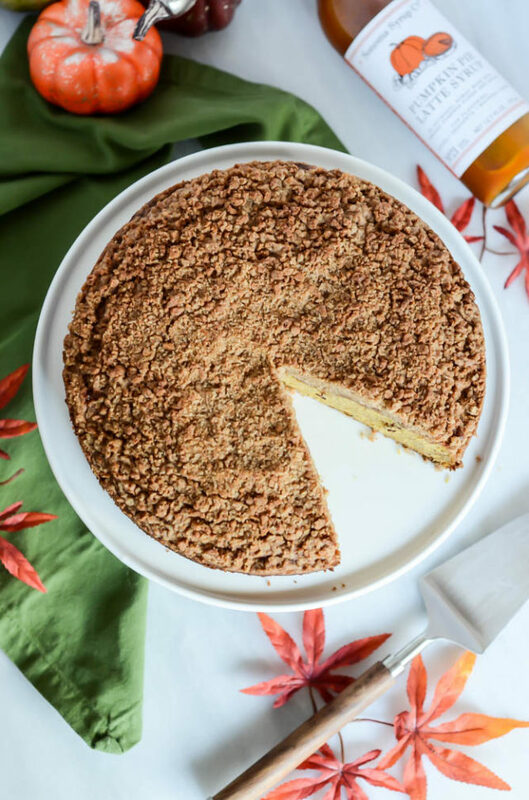 Well, I’m proud to say that, after playing around with things a bit, this Pumpkin Spice Coffee Cake with Amaretti Crumble turned out better than I could have ever imagined. It’s the perfect accompaniment to a hot cup of coffee (maybe even a PSL?) on a cool fall morning – the best way to ring in the season. We ate the first one up in record time, so I’m pretty sure I need to make another one of these to have on hand once Baby D is born in just a few short weeks. 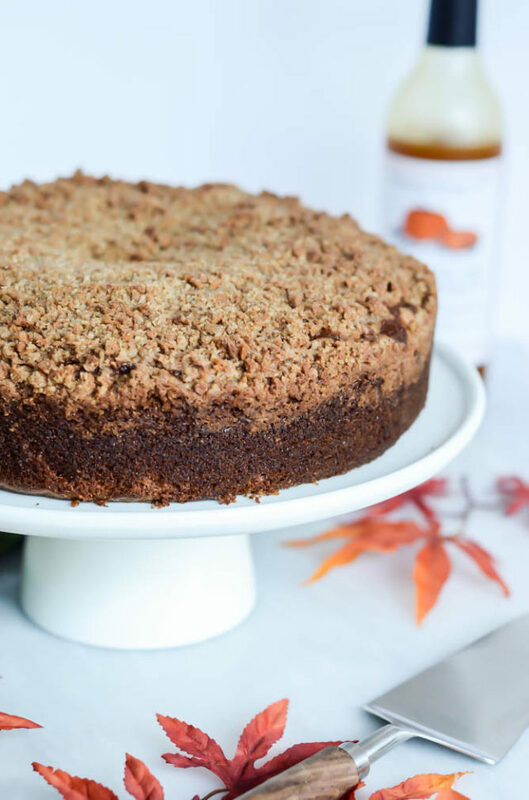 If I’ve succeeded in convincing you that you can’t live another second without this Pumpkin Spice Coffee Cake with Amaretti Crumble (or if you’ve just been really craving a PSL without a trip to your local coffee shop), you can purchase some of the delicious Pumpkin Pie Latte Syrup I used here. I hope you have a wonderful rest of your week filled with alllll the pumpkin things!! 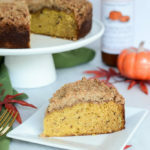 This perfectly moist and dense coffee cake is flavored with both pumpkin puree and pumpkin syrup, and laced with delicious almond flavor in both the cake and topping. Preheat the oven to 350 degrees Fahrenheit and grease a 9-inch springform pan. Cut a piece of parchment paper into a 9-inch circle and place it in the bottom of the greased pan. Set aside. Now, make the crumble. Combine all crumble ingredients in a food processor and pulse until ingredients are incorporated. Set aside. Next, sift together the flour, cinnamon, baking powder, baking soda and salt in a medium mixing bowl. Place butter in the bowl of a stand mixer and beat until smooth. Beat in the sugar and eggs until light and fluffy. Add the pumpkin, pumpkin syrup, vanilla extract and amaretto and beat until combined. Add the dry ingredients and beat to combine, then add the milk. Stir in the almonds and pour the batter into the prepared springform pan. Sprinkle generously with the topping, being sure to use it all. Bake in the 350 degree oven for about 55 minutes, or until a cake tester inserted into the center comes out clean. Cool cake in pan for 15 minutes, then release the cake from the pan and onto a cooling rack to cool completely.